1 Melt 1 tablespoon Spread in large nonstick skillet over medium-high heat and cook chicken, turning once, 8 minutes or until thoroughly cooked. Remove chicken and set aside. 2 Melt remaining 1 tablespoon Spread and cook onion, stirring occasionally, 3 minutes or until tender. Add water and milk and bring to a boil. 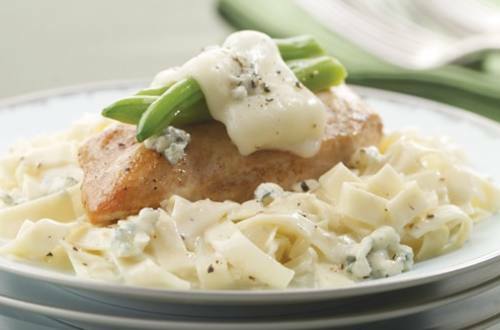 Stir in Knorr® Italian Sides™ - Alfredo and continue boiling until pasta is tender, about 7 minutes. Return chicken to skillet, then evenly top with green beans and mozzarella cheese. Cover and remove from heat. Let stand until cheese is melted, about 1 minute. 3 Sprinkle with blue cheese and freshly grated black pepper.